When it comes to any translation or localization project, we all want the cheapest cost, the fastest turnaround time and the highest quality (no one starts out by saying I want the slowest, most expensive, poorest quality translation), but in reality we never have a perfect world. That is why it is vital to understand your priorities in order to best manage and execute your next translation project. This blog gives an overview of time, cost and quality as it relates to translation project management. Along came a wise-guy engineer who promptly wrote beneath the sign “Pick 2.” While the engineer was making a joke, he actually was onto something with his quip. 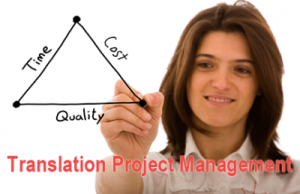 With translation projects, and indeed with any project, there is always a tradeoff. If you are familiar with project management, you may recognize the three attributes of quality, time and cost as the triad of project management. The key is to evaluate each of these aspects (quality, time, cost) of your translation project and then to make a determination as to which two are most important for you. That decision should then be the focus throughout the duration of the project. Some translation projects are urgent and need immediate turnaround while others have no specific deadline, and more time can be budgeted for them. Evaluating how time relates to your translation project is as simple as answering when do you need your final translation by and why. On average, an individual translator can translate about 2,000 words a day. If your project has 20,000 words then you can calculate the cost to be 10 business days for your turnaround time. Remember that you may have to also factor in editing, proofing and desktop publishing (or formatting). The key is finding a reasonable turnaround time to meet the needs of your translation project. If that average turnaround time is not sufficient to meet your needs, there are ways to mitigate time to speed up your turnaround, each of which has an effect on both quality and cost. Here are some of the options you have when it comes to reducing the time needed for your translation project. Using multiple linguists is perhaps the first step to reducing the turnaround time of a translation project. However, you must consider that while it may be faster than using just one translator, there is some additional work. For example, the project manager must reconcile the two “voices” of the translators, and if the source material is highly stylistic it may be harder to harmonize the styles of the individual linguists. Another way to save time is to only use translators and to forego using editors and proofers for your translation project. This saves a lot of time, and even reduces the overall costs, but can have an impact on quality. Editors and proofers are there as second and third sets of eyes to catch any errors or clear up any confusion that the translator may have missed. Without these quality control steps, the overall translation quality may suffer. Machine Translation (MT) can have an extremely fast turnaround time. Also, machine translations are much cheaper, and even free in some cases (Google Translate). However, when using MT, there is a significant gamble as to the quality of the final translation. Do you want to trust your company’s reputation to a machine? Human-Enhanced Machine Translation (HEMT) involves running your source material through a machine translator and then having a human translator “clean up” the final translation, correcting any major errors. This method is much faster than using the traditional translation-editing-proofing (TEP) of a typical translation project, but offers much lower quality than using native language TEP. When your translation project involves highly sensitive, highly technical or high-value information, then quality may be the most important attribute for your translation project. One thing to remember when it comes to seeking higher quality is the phrase “you get what you pay for.” A quality translator with an advanced degree and real work experience with your subject matter will most likely be more expensive than a generalist, entry-level translator. The more levels you add to your translation project, typically the longer the turnaround time and the higher the cost of the overall project. Here are some ways to increase the quality of your translation project. Any project is better that follows a standardized process. When it comes to translation and localization projects, there are standards such as ISO 9001, ISO 17100 and ASTM F2575 that help define translation processes and include quality checks and standards. Using someone who is a subject matter expert as well as a language expert is the best way to ensure that the materials in your source will be properly translated into your target language. As an aside, we at Language Scientific hold to our founding philosophy “if you do not understand it, you cannot translate it.” For example, a generalist with a literature degree may not be best qualified to translate your nuclear engineering or specialty clinical research documents. We have numerous anecdotes of documents that were translated word for word, but got the concept wrong due to lack of knowledge of the subject matter. At a minimum if you are looking for high quality translation, you will want to use translators that are native language speakers, have advanced degrees, years of experience translating, and real working knowledge of the subject matter. To increase the quality of any translation it is always best to use multiple people to go over the translation. Just like when writing, one cannot best edit or proof their own work; with translation it is better to have a translator, editor and proofer to check for errors that a translator alone may have missed. Back translation adds an additional layer of quality checking to any translation project. In this process, a document that has been forward translated is then back translated into the source language by a translator who has no knowledge of the original document. The two versions are then compared to see if there are discrepancies or areas of confusion due to mistranslation. If you have limited or no funds for your translation, then cost will be your most important factor when it comes to your translation project. Depending on how much you need to save for your translation project, you may do any of the following. We discussed machine translation earlier in this blog, and it does reduce the cost of your translation project. However, there are big risks associated with MT, and the savings you may gain in the short term may be negated by long-term liabilities you have due to mistranslations. If time and quality are not important, you may ask a bilingual employee, colleague or friend to translate your documents. A consideration here includes lesser quality because these are not professional, trained interpreters. Also, one should remember that any time spent by an employee on the translation is time spent away from their other work responsibilities. Using just one translator is a way to reduce translation costs, however the time may take longer based on the capacity of that translator’s words per day. What happens when that translator is sick or unable to work on the translation? Also, the quality may suffer because there is no one checking the work of that translator. Human-Enhanced Machine Technology was discussed previously in this blog, but is another way to reduce costs. As stated before, this may be a way to reduce costs, and it also reduces turnaround time, but quality suffers because it is ultimately one linguist’s proof of a machine translation. A way to increase the quality here is to increase the time that the linguist spends on the project, but that then increases their hourly/project rate. When it comes to translation projects the client, translation vendors, the translators, editors, project managers and all involved with the translation or localization must be on the same page. You must be able to weigh your specific goals to determine how you can best achieve them. You must determine how time, quality and cost relate to your larger goals and then figure out which two are most important. The project manager throughout the project can then balance those aspects of your project accordingly to meet your needs. What factors concern you the most when it comes to translation projects: time, cost or quality? Please let us know in the comments section, and as always, please like and share this blog socially.